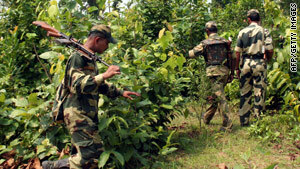 Indian troops on patrol in a jungle area known to be a Maoist stronghold earlier this year. New Delhi, India (CNN) -- Dozens of police officers were involved in a gunbattle with rebel Maoists in the rain-drenched forests of eastern India Wednesday, police reported. Security forces had been tracking the insurgents when a shootout erupted in Chhattisgarh state's Dantewada region, police spokesman Rajesh Mishra told CNN. There were no immediate reports of casualties, but reinforcements were rushed to the scene, Mishra added. India regards Maoist rebels as its gravest internal security threat. Until June this year, authorities blamed 1,103 violent attacks in the country on left-wing extremists. More than 200 officers and 97 rebels were killed during that period, federal home minister P. Chidambaram said last month. Police have also arrested at least 1,341 suspected Maoists. "These figures underscore the gravity of the challenge posed by left-wing extremism," Chidambaram said. We have not achieved as much success as we would have liked in containing this menace. In April, more than 70 officers were killed in Dantewada in an ambush -- one of the deadliest attacks on Indian security forces by suspected guerrillas. Officials say Maoists aim to seize political power through what they call a protracted people's war. On their part, the insurgents have claimed since the 1960s to be fighting for the dispossessed. Indian prime minister Manmohan Singh conceded last year that the nation's fight with the rebels had fallen short of objectives. Maoists enjoy support not only in the poorest areas and in tribal communities but also among youth and the intelligentsia, officials suspect. "We have not achieved as much success as we would have liked in containing this menace," Singh said last September. In addition to targeting police, alleged police informers and people they call "class enemies," the rebels are also believed to be attacking infrastructure such as roads, bridges, railways, and power and telecommunication networks. India says it has adopted a two-pronged strategy -- involving development and police action in Maoist strongholds -- to deal with the problem. Yet, Chidambaram in his statement in July this year accepted the planning has delivered mixed results. While forces stopped many attacks and apprehended key Maoist leaders, the guerrillas too have been successful in carrying out serious assaults in several instances, he noted.